LOL… Actually, this was my Victim-of-the-Day for my Project 365 (technically 366) – a photo a day for a year. My project is now up to date, so please check out the new photos added. Captured a brilliant photo of the Sandia Mountains yesterday. The story on this one… I met my friend Lyn, a professional dog groomer, at the store she is going to move her business into. The current business, which is some sort of sewing shop, obviously has not yet moved out all their equipment and supplies. 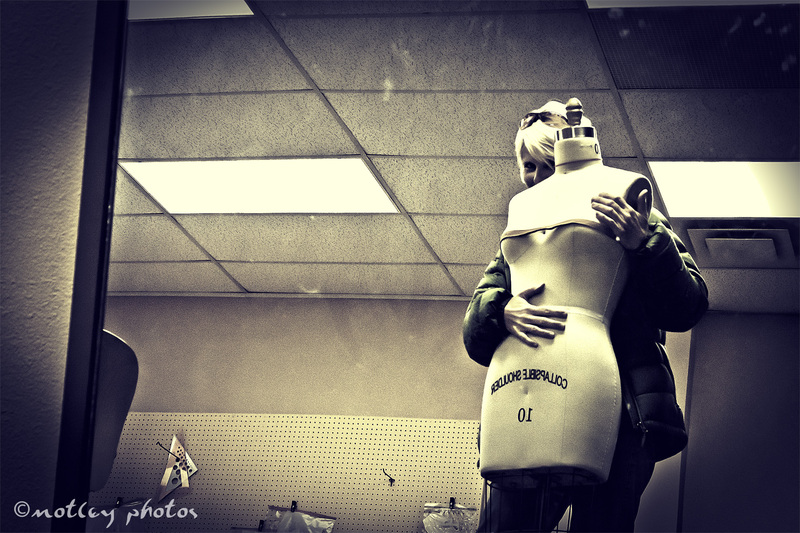 I glance to the right, see a very large full-body mirror and a half-body dress form mannequin. I could not resist the urge to have some fun. This photo is more PG-13… I have some others that would border more on an R rating… Shop Name: Completely Gone to the Dogs; Location: Tramway and San Rafael, Albuquerque NM. I will be doing all the graphics and website for the store, so watch for my coming posts. It will be a month or two…. So I guess that I’m not the only one who enjoys a little fun with a dress form? I was. Looking forward to her shop opening up. I’m creating a bunch of doggie design to sell in the store and online. She’s my closest friend and I’m moving back in with her in a few weeks. My MS is getting worse and going to have to cut back to part time at work as well as work from home. I don’t want the stress of rent over my head because I wouldn’t be able to cover it with part time hours. Plus while she’s in the shop all day, she loves the fact I’ll be there to take care of the dozen or so dogs that live there. In and out… in and out… all day long. But they’re worth every bit of it. BTW, has anyone mentioned you have beautiful, long, artistic fingers? LOL… No, but I’ve had a few women comment that I have “man hands.” That’s because those that said that are barely 5 feet tall and have hands of a child. I played piano for years, but now, I’m happy if I can remember chopsticks. I wouldn’t mind being several inches shorter, but not if it means stubby fingers. LOL… actually, I have always wanted to be about 5′ 10″. I’m 5′ 6″ (but shrinking… damn gravity).